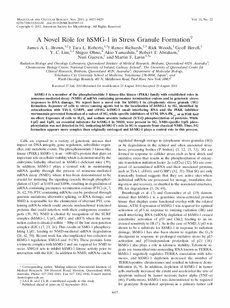 hSMG-1 is a member of the phosphoinositide 3 kinase-like kinase (PIKK) family with established roles in nonsense-mediated decay (NMD) of mRNA containing premature termination codons and in genotoxic stress responses to DNA damage. We report here a novel role for hSMG-1 in cytoplasmic stress granule (SG) formation. Exposure of cells to stress causing agents led to the localization of hSMG-1 to SG, identified by colocalization with TIA-1, G3BP1, and eIF4G. hSMG-1 small interfering RNA and the PIKK inhibitor wortmannin prevented formation of a subset of SG, while specific inhibitors of ATM, DNA-PKcs, or mTOR had no effect. Exposure of cells to H2O2 and sodium arsenite induced (S/T)Q phosphorylation of proteins. While Upf2 and Upf1, an essential substrate for hSMG-1 in NMD, were present in SG, NMD-specific Upf1 phosphorylation was not detected in SG, indicating hSMG-1’s role in SG is separate from classical NMD. Thus, SG formation appears more complex than originally envisaged and hSMG-1 plays a central role in this process.